Mitsubishi Motors will launch a plug-in hybrid version of its new Outlander during the course of FY2012. The new PHEV Outlander will be a permanent 4WD electric vehicle, supplemented by a gasoline engine when needed. When fitted to the all-new Outlander, the Mitsubishi plug-in hybrid EV system will allow for a range and very low emissions similar to that of the Concept PX-MiEV II show car (earlier post), i.e. a driving distance of more than 800 km (497 miles) and a CO2 target below 50 g/km. The drivetrain combination of front electric motor, rear electric motor, and front traction/generator gasoline engine will result in a choice of three driving modes: pure electric (dual motor 4WD electric mode); series (dual motor 4WD EV supported by ICE generator); and parallel (dual motor 4WD EV supplemented by ICE-powered FWD). MMC’s EV-based plug-in hybrid system uses high-capacity traction batteries that allow the vehicle to cover more than 50 km (31 miles) in 4WD electric mode alone, allowing it to be driven solely as an EV for most everyday situations. Depending on power consumption and remaining battery charge, the system will start the gasoline engine automatically as a generator (Series Mode). At higher vehicle speeds, the gasoline engine, with its better high-end energy efficiency, will supply supplementary drive torque to assist the front and rear motors (Parallel Mode). In addition, with the push of a button, the driver has the freedom to select a Battery Drive Mode"when she/he wishes to drive quietly and emissions-free (at sufficient battery levels) in residential areas or the countryside using pure EV power. At the same time, the driver can also switch to a Battery Charge Mode while on the move, controlling use of battery power and using the engine as a generator to charge the batteries. Mitsubishi Motors’ P-HEV system uses a newly developed dual-motor four-wheel-drive system mated to Mitsubishi’s S-AWC (Super-All Wheel Control). Based on the four-wheel-drive technology developed in the Lancer Evolution, S-AWC it integrates control of the 4WD, ASC and ABS systems. Working in tandem with the Mitsubishi plug-in hybrid EV system, S-AWC also contributes to better fuel efficiency. The two motors drive the front and rear axles independently. Being virtually lag-free and offering superior control, the motors ensure finer more precise control of the 4WD system. The Twin Motor 4WD system does away with the propeller shaft, hydraulic system and clutch plate used to connect the front and rear axles in conventional 4WD systems. The new Outlander. 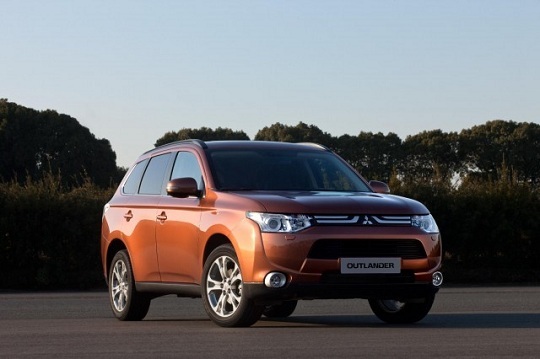 MMC unveiled its third-generation Outlander at the 82nd International Geneva Motor Show. The new version of the successful mid-size crossover (more than 950,000 units sold as of end of December 2011 since June 2001) was developed around a versatile global platform. In Europe, the new Outlander will be made available with a choice of two different engines: a 110 kW (148 hp) 2.0L MIVEC gasoline engine fitted with an all-new valvetrain; and a 110 kW 2.2L diesel with a number of innovative features including an ultra-low 14.9:1 compression ratio. Further improvements allow for high performance and low emissions. The new Outlander will feature a new Automatic Stop & Go system and and all-new 6-speed automatic gearbox.